I drove into the town of Socorro in the state of New Mexico (USA) to find a motel room for a night. Most motels and hotels were full. Fortunately I found a room. “You’re here for the visit tomorrow, right?” a young lady asked me at the reception. Trinity? 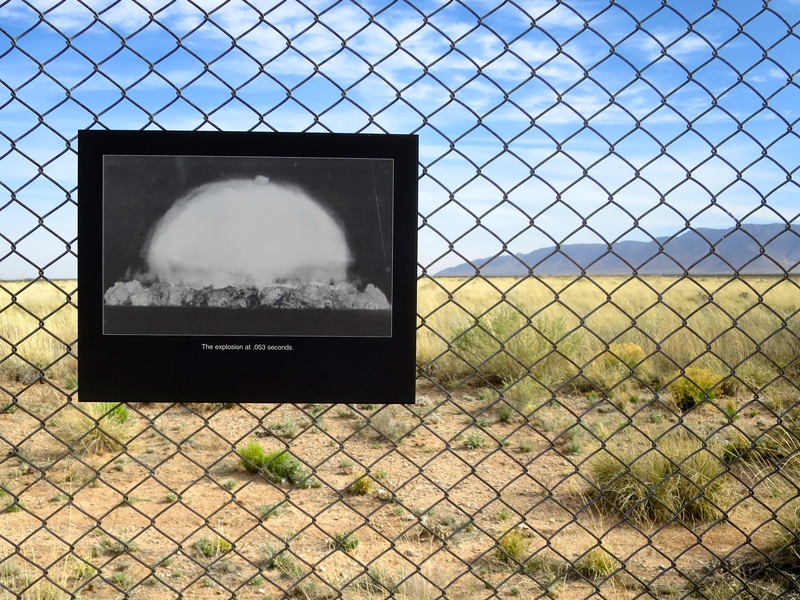 Where humans first saw the mushroom cloud of an atomic explosion? 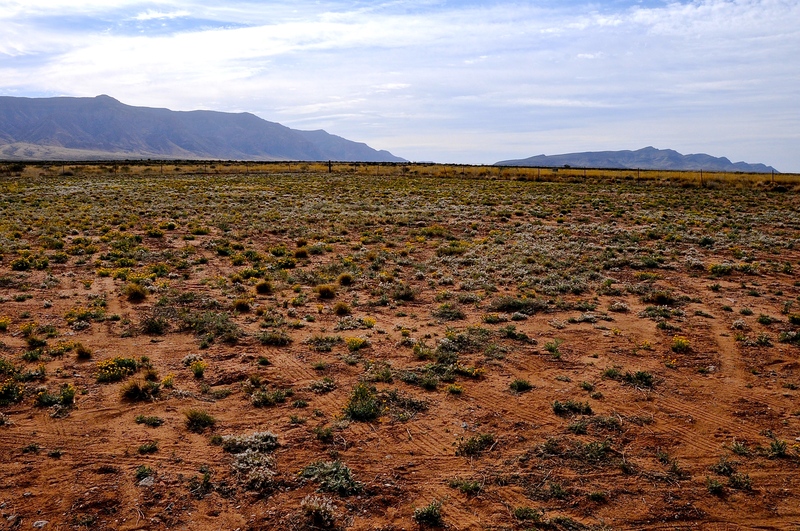 Where desert sand transformed – instantly – to glass? Where physicist J. Robert Oppenheimer muttered the words from the Bhagavad Gita – ‘I am become death, the destroyer of all worlds’? “Can you show me where it is on this map?” I asked. On July 16, 1945, a bomb with a plutonium core was raised to the top of a 100-foot steel tower standing on desert sands in what was then the Alamagordo Bombing and Gunnery Range. The site was named Trinity. At 5.29 am, a 19-kiloton atomic explosion was the first ever produced by humans – ushering in the era of nuclear arms. 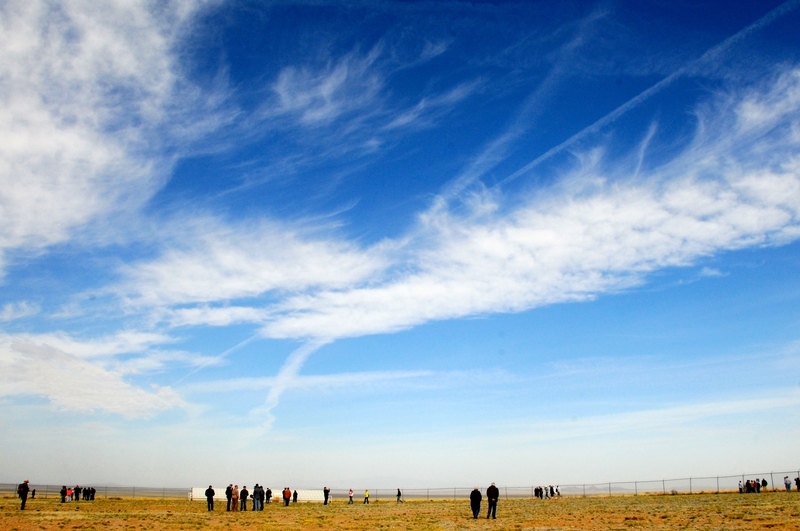 Observers sat and watched from protected bunkers almost two miles (three kilometers) away. The shock wave broke windows 120 miles away and turned the desert sand into a glass now called Trinitite – formed in temperatures of 14,710 degrees Fahrenheit (8,154 degrees Celsius). New Mexico, the state that hosted the ever first atomic explosion, was also the state where the first vitis vinifera grapevines were planted in the US to produce wine (in the early 1600’s). 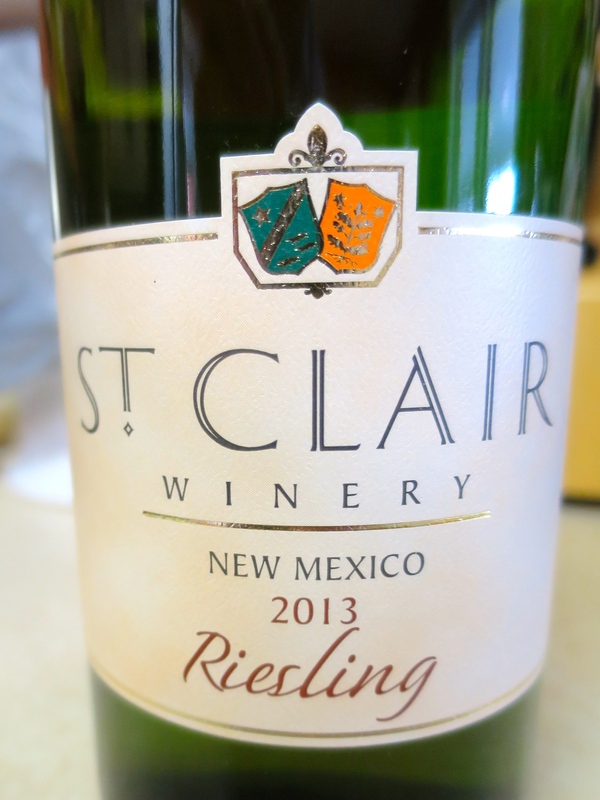 There are now almost 50 wineries in New Mexico, producing mostly decent white wines, including Riesling, Chenin Blanc, and Muscat. 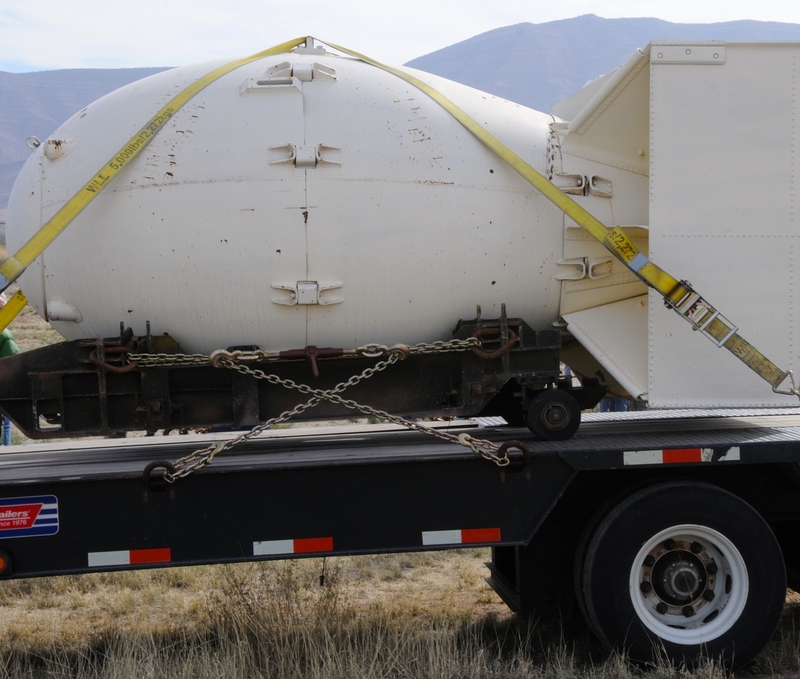 Does residual radiation from Trinity impact New Mexican grapes? Is there a nuclear tinge to the local wines? Hardly. Many places on earth have more natural radiation than at Trinity. A one-hour visit there exposes a human body to one millirem or less – half of what we receive by flying in a jet across the US. Still, the visit made me wonder about how nuclear events, and nuclear accidents, have impacted the world of wine. According to a 2008 article on the Wine Economist blog, the April 26th, 1986 accident at the Chernobyl nuclear reactor in the Ukraine released a plume of radioactive fallout into the atmosphere that was carried by prevailing winds north and west. Scandinavians soon were on high alert and avoided at all possible foods that may be contaminated by radiation. Because the plume passed partially over France on its westward voyage, there was fear that it might contaminate French vineyards. The Swedish national alcohol monopoly then sought alternative sources of wine to sell – and phoned up a wine negociant in the state of Washington in the USA. Long story short – he bought surplus wine, bottled it, and sold it to Sweden. Suddenly, the European appreciation of American wine expanded. Buyers even flew to Washington to meet this negociant. And atomic tests result in technology that could help detect wine fraud. Since the first atmospheric tests of nuclear devices began, the atmosphere received huge amounts of radioactive carbon-14. Atmospheric tests ceased in 1980 – the Chinese being the last to explode an atmospheric nuke. The quantity of carbon-14 diminishes over time, diluted by carbon dioxide. By analyzing wines, however, we can tell what the relative ratio is in the alcohol between stable carbon-12 and diminishing radioactive carbon-14. This means we can date the wine through atomic analysis. Does that have an advantage? It can help let people know whether the wines they are buying are fake – produced more recently than the label on the bottle. However, to be worthwhile, any test would have to be reasonably priced. After pacing the land at Trinity and gaining a new appreciation peace and stability, I visited nearby friends to uncork multiple bottles of New Mexican wine. Some were extremely good. Yet there’s ample room for improvement. Of nine bottles sampled, only five made the cut as being of reasonable value for price. Of the other four (not listed below), two cost in the mid- to high twenty dollar range, and were less than mediocre in taste.